As you may have seen on some of my previous articles, at the beginning of our ride across Canada in winter, we had problems with traction. As we entered the Yukon Territory, we were on smooth road tires while trying to ride on sheet ice. Due to our light bikes we did surprisingly well, but we still threw our bikes down the road quite a few times. Now this was okay on the deserted roads up north, but on the busy roads of the south, it was not a safe way to travel, so we decided to get some traction. And that’s where off-road tires fitted with Aerostich studs came in. Installation is simple, only requiring a screwdriver, not a stud gun. So what’s the theory? Basically, the off-road tire’s knobs deal with the snow just like they do with mud, but you need the studs deal with the ice. So how do you fit them? 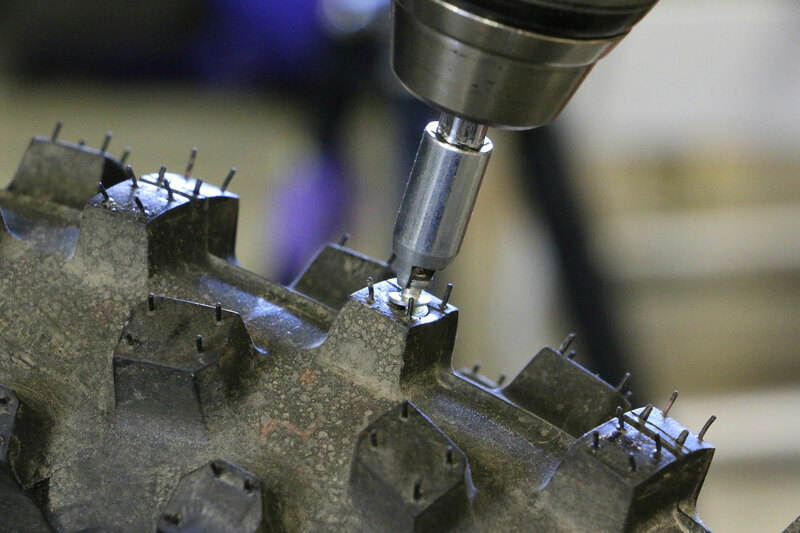 You simply put the included tool in a cordless drill, put a stud in that and then screw it into the tire, stopping when the stud shoulder is flush with the tire. It’s as easy as putting a screw in a piece of wood. What do they feel like on the road? I’m not going to lie, on bare tarmac they’re a little nerve-wracking. The front feels very vague and it takes a lot of confidence to trust it, but you get used to it and learn to corner a little more cautiously. What do they feel like on ice? They feel brilliant. Our studs transformed our handling and allowed us to almost always recover power slides and front-end wash outs. The best way to describe the handling was like running aggressive motocross tires on road. It’s not amazing, but you can have fun and still rescue it. 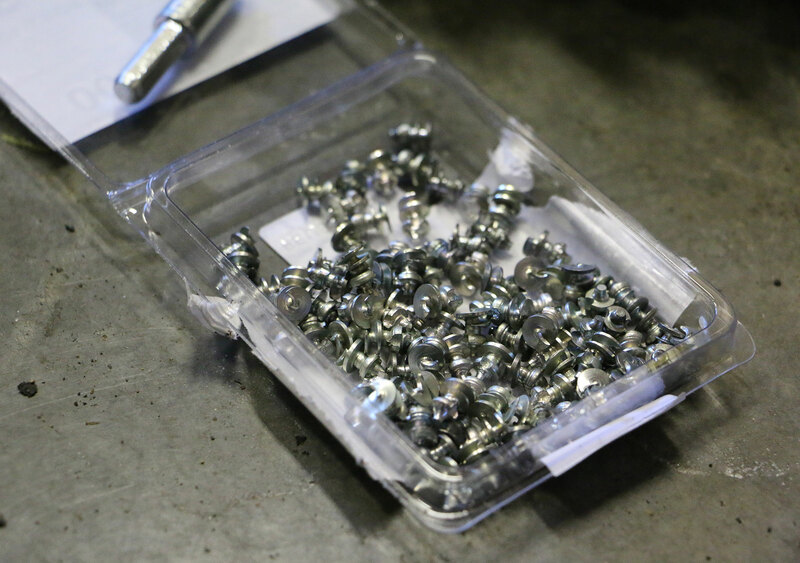 Ed and Rachel were only able to obtain a limited number of studs, thanks to a stock shortage, that affected their results. Rach and I were aiming for 100 studs per tire, but due to a stock shortage, we only ended up with 50. As I’ve been riding on ice longer than Rach, I gave her some of mine too. So Rach ended up with approximately 65 per tyre and I had about 35. This meant that at any one time, we only had one or two studs in contact with the road, so the studs were put under a lot of strain that they were not designed to take. There is also the added problem of our tires’ knobs being so small that we could only fit the smallest and narrowest studs. This meant that not only did we have studs under strain, but they didn’t have much of a bite in the tire to hold them in. For us, they started to get rotated round in their holes and pushed into the tire after approx 50km of bare tarmac. Ed and Rachel were only able to install a minimal number of studs, but that did make for better handling when there was no ice. But, that wasn’t the point of the studs. Rachel’s studs fared better than mine, which is probably due to her having more studs, but it could also have been due to my love of power sliding occasionally. Once they rotated round a bit and settled, they stayed there for a little while longer before eventually falling out. The rear ones were the first to go, starting at about 200 km, though the last ones lasted until around 2,000 km. The front ones lasted a lot longer and would slowly but surely fall out until they were pretty much gone after 4,000 km. So I guess the time has come to give my opinion of them; it’s a difficult one to give but here goes: when they were in, the grip was lovely, with just the right amount of grip on ice without making the tires hideous to use on bare tarmac. After a few kilometres, the strain on the studs twisted them backwards. Eventually, they all fell out. But in terms of lifespan, I couldn’t recommend our particular setup. My guess is the combination of our tiny studs for tiny tires, plus limited quantities of them meant that the job was just too much for them and they started to fall out pretty quickly. The weight of a loaded bike, plus rider, breaking on just one screwed-in stud was bound to fail eventually I guess. Next time I’d be tempted to try a lot more studs with bigger grip screws in the hope it lasted longer. Ed’s previous ice tire setup had much better longevity. But I think I’d probably go for my C90 ice tire that I still have back in the UK. It has much larger studs so although the road handling is horrific, the performance on ice is staggering. But that’s not why I’d choose it. I’d chose it because the studs are actually cast inside the tire when it’s made. This means they simply can’t tear out, plus there’s a huge amount of them. To the right is a photo of that tire from my Arctic trip after covering around 2,000km, and after another 3,000km it’s now hanging in my shed in exactly the same condition. You can find the studs used at Aerostich.com; note they have a selection of sizes, depending on your application. When these eventually come out, I wonder how many punctures they will give other motorists? That’s a risk Ed was willing to take!